Rev. 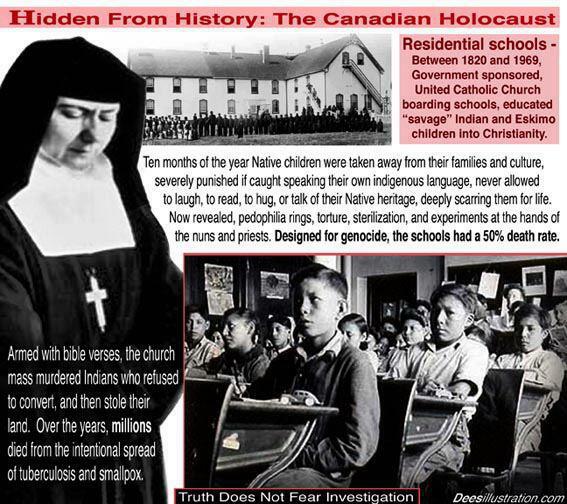 Kevin Annett - Genocide of Canadian aboriginals at 25 million; 50,000 children now missing; Key witness William Coombes assassinated by Crown and Vatican agents Rev. Kevin Annett sets out the prima facie evidence for Queen Elizabeth and Prince Philip's personal involvement in the disappearance of 10 aboriginal children abducted by them from a residential school in Kamloops, BC in the period Oct. 5 - 13, 1964 and never seen again in their lives. The Mask Slips, for Those with Eyes to See: Preparing for the Real Pandemic by Kevin D. Annett, M.A., M.Div. [April 2008] Did the Illuminati Exterminate Canadian Indian Children? By Henry Makow Ph.D.
Hidden No Longer: Genocide in Canada, Past and Present By Kevin D. Annett, M.A., M.Div. This documentary reveals Canada's darkest secret - the deliberate extermination of indigenous (Native American) peoples and the theft of their land under the guise of religion. This never before told history as seen through the eyes of this former minister (Kevin Annett) who blew the whistle on his own church, after he learned of thousands of murders in its Indian Residential Schools..."
Witness to murder at Indian Residential School.. Irene Favel describes in a CBC interview (July 8, 2008) how she witnessed the murder of a baby by staff at the Muskowekwan Indian Residential School, run by the Roman Catholic Church in Lestock, Saskatchewan.